i-Series 1/32, 1/16, 1/8 DIN Programmable Temperature/Process Controllers with RS-232 & RS-485 Communications. High Quality! 5-Year Warranty Std. 2 Outputs: Control, Alarm, or Retransmission of Process Variable. The iSeries are 1/8, 1/16 and 1/32 DIN controllers featuring the big iSeries colour-changing display. The digits are twice the size of typical 1/8 DIN panel meters. 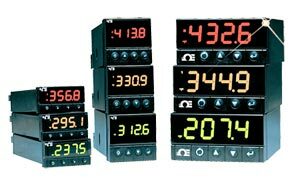 The iSeries meters feature the only LED displays that can be programmed to change colour between GREEN, AMBER, and RED. Featuring optional "embedded Internet" (specify "-EIT" option) the iSeries are the first instruments of their kind that connect directly to an Ethernet network and transmit data in standard TCP/ IP packets, or even serve Web pages over a LAN or the Internet. The iSeries are also available with serial communications. With the "-C24" option, the user can select from the pushbutton menu between RS232, RS422, and RS485, with straightforward ASCII commands or MODBUS. Nota: Refer to the Related Links for CNi32, CNi16 and CNi8 for complete specifications. i-Series 1/8 DIN Programmable Temperature/Process Controllers with RS-232 & RS-485 Communications. i-Series 1/16 DIN Programmable Temperature/Process Controllers with RS-232 & RS-485 Communications.